According to TheKnot, a popular wedding planning website, the average cost of an American wedding in 2014 hit the mind-boggling number of $31,213 (though their numbers include the cost of the engagement ring). Any event with a budget to the tune of 30 grand inevitably becomes a complicated planning endeavor, with hundreds of tasks and projects, all of which add up to piles of cash leaving your wallet. One of the big expenses that figures into that sum is a wedding planner, which isn't surprising: for many people, their wedding is the most complicated project management exercise they'll ever be involved in. I, on the other hand, consider project management one of my professional competencies. As my fiancee and I work to plan our wedding, I've found that we've been able to apply many of the tools I already knew and loved, and those tools have allowed us to reduce our stress levels, minimize our own amount of work, and save a good bit of cash. While we looked at the fancy "official" wedding tools (like TheKnot itself), all of them seemed to have some fatal flaws. They make assumptions about what you want to do with your wedding and subtly encourage you to do more than you might care about (and therefore spend more money). But the biggest issue with common wedding planning tools is this: they assume one person (generally the bride) is handling all the wedding planning, and offer minimal opportunities for collaboration. Frankly this is just antiquated nonsense in 2015, so we rolled our own. Here's how. OneNote is a free and cross-platform note-taking app from Microsoft, and my fiancee and I rely on it for just about every aspect of our lives. In fact, I keep track of all of my ideas for new blog posts and then write the first drafts in OneNote before I port them to Markdown and make some final tweaks. The first thing we did when we started thinking about our wedding, even before we got engaged, was make a new section of our shared notebook for wedding planning. As we start thinking about each consideration, like what photographer to work with, we added pages to use to gather ideas and information. On our photographer pages, we collected links to articles about how to choose a photographer, a list of recommendations from our friends, and our own shortlist of who to reach out to. OneNote makes it trivial for both of us to throw our ideas into a single place and lets either of us follow up on the details. Wedding planning seems to involve hundreds of to-dos, from the most rudimentary (buy shoes) to complex multi-step processes (find a photographer). We needed to keep track of all of these tasks in a shared list, and while we could have just done that with a checklist in OneNote, we wanted to be able to add due dates and sort/filter our tasks. Enter Wunderlist, a beautiful and easy to-do app. I created a list for our wedding and shared it with my fiancee. We both threw everything we could think of on the list, then assigned due dates and owners to most of the tasks. 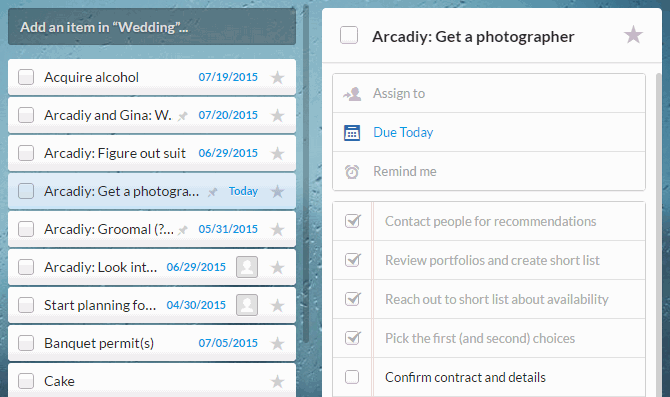 For the more complicated tasks, like coordinating with the bridal party, we added subtasks. Now we're pretty much in execution mode, following the plan outlined in our shared list and checking tasks off with a reassuring ding. And thanks to Wunderlist's awesome mobile apps, as we learn about something new or realize we forgot something, both of us can add new to-dos from wherever we may be. One of the sneakiest examples of costs that add up is the traditional expectation to mail and print save the dates and wedding invitations. Between printing, envelopes and stamps, the save-the-dates alone can add up to several hundred dollars. We figured that for most of our friends who check their physical mail far less often than their email, this would be a complete waste of money. Moreover, we'd have to manually and slowly reach out to each person to get their address before we could send them the save the dates. We thought: why not do a digital save-the-date instead? If you've listened to a podcast in the past few years you've undoubtedly heard of MailChimp (or Mail…Kimp?). As a service optimized for sending mail to large groups of people, it was a perfect way for us to create an email once and make sure everyone got it. We simply added everyone's emails to our mailing list, customized one of their existing templates to our needs, and hit "send." 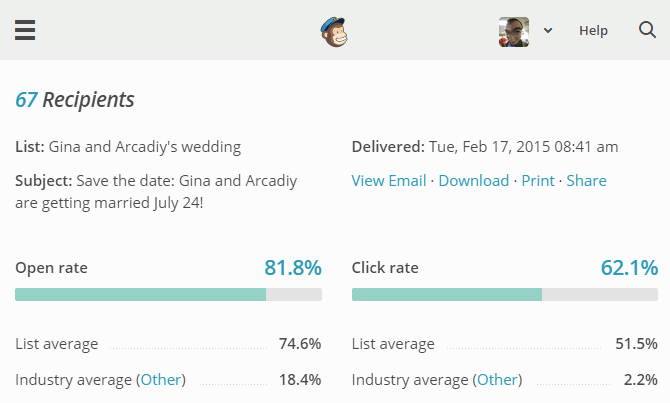 The best part is that MailChimp allows us to track who has opened our e-save the date, so we were able to follow up directly with the people who hadn't after a few weeks. And for everyone else, there's no worrying about whether they got the information. Because we sent electronic save the dates, we didn't have to run around collecting people's addresses beforehand. What we did do, however, is create a pre-RSVP form we asked folks to fill out, asking them for their address and whether they already knew if they were going to be unable to make our wedding. We could have easily used Excel Surveys or Google Forms for this, but I'm a big fan of Wufoo for my form needs. They make it trivial to create the form you want, and include a bunch of nice extras; the ability to send us an email every time someone filled out the form has been especially nice. We simply embedded that form directly into our wedding website and linked to it from our save the date email, and voila: most of our invitees have given us their addresses in a nice pre-formatted way, with almost zero effort from us. In fact, our experience with our Wufoo form has been so good that when we're ready for the "real" RSVPs we'll do those the same, electronic-only way. As we continue to plan our wedding, we'll keep looking for smart, creative ways to save time and money. For example, we are considering printing our wedding invitations as business cards from Moo. And I'd love to hear your ideas about other useful tools we could use. Of course, to make the most of these tools you also have to take a somewhat non-traditional approach to your wedding. But we're okay with that: we simply think of it as planning a wedding in the 21st century and embracing everything that means.